Learn more about the different tools available and how they can be used to expand your business. Customer Relationship Management (CRM) tools – Consider the time you spend each day responding to inquiries, pulling quotes and delivering professional proposals. A powerful CRM can help you accomplish these tasks and run you business more efficiently. Automation tools -Find ways to eliminate some of the tasks that take time away from prospecting, planning and closing sales with automation tools. While they may require some upfront training, the benefits they provided can be major cost-savers. Quoting and enrollment tools – Today’s consumers are accustomed to having the information they need available with the click of a couple of buttons, they expect the same when searching for health insurance quotes and the ability to enroll in coverage. Don’t leave them disappointed. Email service – When it comes to growing your business, every detail matters. Make sure your clients are prospects are receiving emails that assure them you are a well-established, professional and legitimate agency. 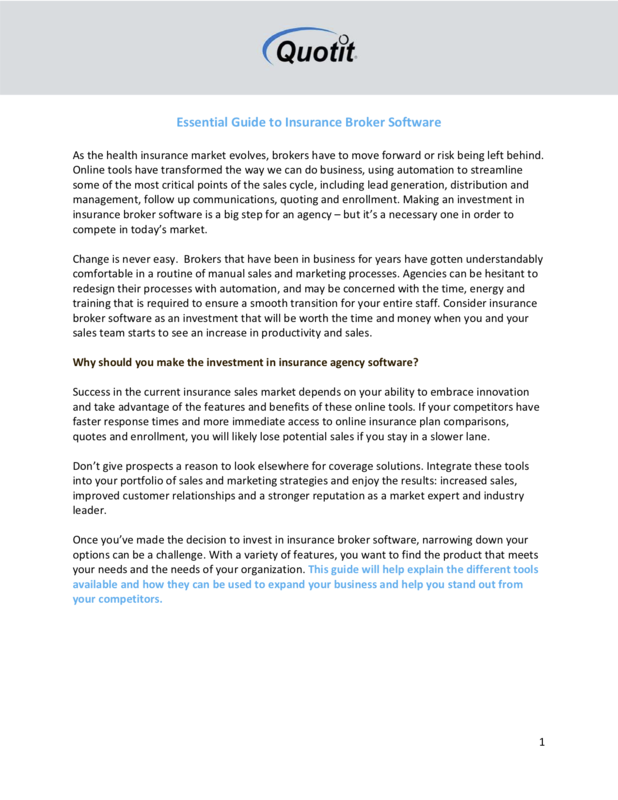 Success in today's insurance sales market depends on your ability to take advantage of the features and benefits offered by online tools. While change is never easy, it's important brokers don't fall into a rut in a routine of manual sales and marketing processes.